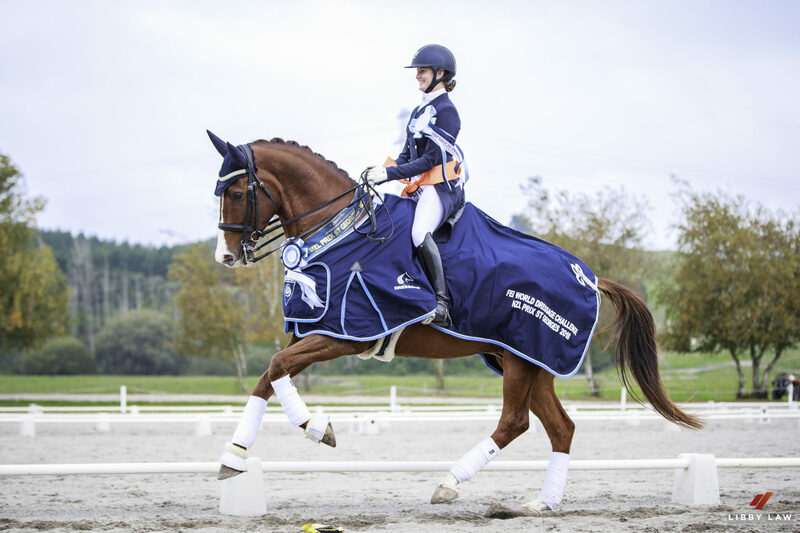 Melissa Galloway on Top of FEI World Challenge Prix St Georges World Ranking. Four podium finishes for NZL. “That is awesome news. I am just so very proud of Joey” was the elated reaction this morning from Melissa Galloway when she was told she had come out on top of the Prix St Georges class in the 2018 FEI World Dressage Challenge. Melissa and Joey (Windermere JObei W) had to fend off 79 other challengers worldwide but managed to narrowly hold the lead on 71.985% from Riley Alexander (AUS) 71.250%, Svenja Grimm (CHI) 71.176% and Susanna Foustok (UAE) 71.029%. Waikato’s Gaylene Lennard and Jax Johnson were third in the enormous 165 strong Senior I class Sachleen Kaur and HPH Levitate finished third in the Youth rankings in a huge field of 115, Kieryn Walton ( Rosari Don Carlos) 17th from 44 in the INT I and Christine Weal (Schindlers Liszt) 13th from 124 in the Senior II. The NZL naming rights sponsor Livamol representative, Kerrin Beatson, was ecstatic about the NZL performance and looks forward to the 2019 event in April, while NZL Prix St Georges sponsor, Louis Schindler (Syncroflex) was thrilled with Melissa’s world win.